Training Variety � a broad range of professional development programs and initiatives. Value, Quality and Relevance � high quality and relevant professional training. Assistance to the Field � technical assistance and direction. Field Research � research and program evaluation of interest practitioners and policymakers. 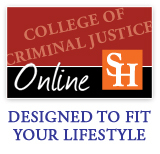 SHSU offers quality degree programs that set the standard for education and scholarship in the study of crime and criminal justice. Learn from internationally renowned faculty and gain scientific knowledge and critical thinking skills that will help you achieve a competitive edge. We have degree programs that will fit your lifestyle and career goals. This training will help participants develop the preparation, presentation and platform delivery skills needed to conduct training using curricula developed by the National Institute of Corrections. The CMIT Research Division presents these briefs to provide facilitators, staff, administration, and others an overview of literature as well as provide helpful tools and information to assist those in the field. These briefs will be featured quarterly. In September 2012, the Correctional Management Institute of Texas took a big step forward in the use of technology and hosted its first live internet broadcast. The broadcast was such a success, CMIT has determined this is a great resource to the field and will continue to host internet broadcasts. Each broadcast will be recorded and once edited, it will be placed on the website for those that may have missed the broadcast to view or those that need to view it again.